Gardeners are increasingly concerned about the status of pollinators in Ohio. Important pollinators such as honey bees, bumble bees and monarch butterflies have gained attention in recent years due to concerns about declining populations. Pollinators are vital to the production of many food crops and provide a service essential to the survival of many native plants. Fortunately, gardeners can take steps to support these and other pollinators through plant selection and simple gardening practices. This fact sheet describes the importance of pollinators, their role in the ecosystem, and actions gardeners can take to help pollinator populations in their yards and gardens. Bumble bee visits aster flower for pollen and nectar. Pollination is the movement of pollen from the male part (anther) of one flower to the female part (pistil) of another flower. Without pollination, most plants can't make seeds and fruits. Many plants are wind pollinated (e.g., grasses, small grain crops, and conifers), but others rely on animals, primarily insects, to carry pollen from flower to flower. Plants attract pollinators by offering rewards, such as pollen, nectar and floral oils. Flowers also provide shelter and gathering places for pollinating insects. Flowers depend on repeat visits by pollinators, so many offer small rewards repeated at regular intervals to encourage return trips. Flowers use a variety of strategies to attract pollinators, including petal color, scent, UV light patterns and nectar guides. Bees in particular use floral qualities such as polarized light patterns, petal texture, temperature, humidity, and electrostatic charge to help them locate flowers. Swallowtail butterfly drinks nectar from bottlebrush buckeye flowers. Lines and coloration on petals help pollinators quickly find rewards. Animal pollinators are essential to the food we eat. Some scientists estimate that one in three bites of food we take can be traced back to the role of animal pollinators. A 2012 study at Cornell University estimates that bees and other insect pollinators contribute $29 billion annually to U.S. farm income by pollinating 58 crops, including almonds, apples, berries and squash. Pollinators play a key role in the production of many foods in the home garden. In addition to their role on farms and gardens, pollinators are essential to the survival of native plants. Approximately 75 percent of all plant species depend on animal pollinators to move pollen from plant to plant. Without the work of pollinators, many native plants couldn't produce seeds to ensure the plant's next generation. These seeds and the fruit that often accompany them also provide important food sources for approximately 25 percent of birds and many mammal species. Key animal pollinators include honey bees, native bees, flies, moths and other insects, as well as birds and some mammals. Bees are considered the most important pollinators because they are uniquely adapted to gather and transport pollen. Bees rely on flowers for food to feed their young, so they actively seek out and visit flowers. Bees' fuzzy bodies and branched hairs help female bees collect pollen into special structures, such as pollen baskets on the hind legs or long hairs on the thorax or abdomen. Bees also forage for food close to their nesting sites, a practice called central place foraging. Bees visit one or only a few flowering species during each foraging trip, even when other flowers are available. This behavior, called flower fidelity or flower constancy, makes bees especially reliable couriers to move pollen to receptive flowers. Bees can be divided into three broad groups: social bees (bumble bees), solitary ground-nesting bees (such as mining bees), and solitary cavity-nesting bees (including mason bees and leafcutting bees). Bees are often confused with wasps. Wasps may visit flowers for nectar, but they rely on insects or spiders—not pollen—to feed their young. Solitary wasps are beneficial predators; they are rarely aggressive. Social wasps, such as yellowjackets and hornets can become aggressive and may sting repeatedly. Social bees like bumble bees will usually only sting when defending their nest. Solitary bees such as mining bees and leafcutting bees are not aggressive. Many of these bees can't penetrate human skin with their stingers. Animal pollinators and bees in particular are currently facing many threats, such as lack of forage (flowers for food), pests, pathogens, pesticides, invasive plants, climate change and lack of suitable nesting sites. Gardeners can play an important role in pollinator conservation by providing plants and nesting sites for pollinators and by adapting gardening practices to protect pollinators. The western honey bee is a key agricultural pollinator. (Photo courtesy of Karina Weatherbee.) Native mining bees frequently nest in sandy soils on south-facing slopes. Some cultivars with complex petal arrangements and unusual colors are less attractive to pollinators, such as this 'Hot Papaya' purple coneflower. Trees, shrubs and herbaceous plants can provide food and nesting habitat for pollinators. An abundance of different flower shapes, sizes, and colors will appeal to a variety of pollinators. Grouping plants together in sunny locations helps pollinators find and feed on desirable flowers while expending less energy in the search for plants. By observing flowers in the garden and taking note of any flower visitors, gardeners can learn which plants are most attractive to pollinators. Additionally, many plant lists are available to help with the selection of plants for pollinators (find plant lists at go.osu.edu/gardensandbees. Different flower shapes and colors attract different pollinators. For example, red tubular flowers with a nectar reward tend to attract hummingbirds. Daisy-like flowers that provide nectar and pollen in shallow flowers are often visited by bees and flies with shorter mouthparts. Some cultivars and hybrids don't offer the pollen and nectar rewards that so-called "straight species" do, since the quality and quantity of nectar and pollen are sometimes lost during breeding. Plants bred with "double" flower petals are often inaccessible to pollinators. Gardeners can include less refined plants along with plant cultivars to offer broad pollinator appeal. Different species of bees, butterflies and other pollinators are active in Ohio at different times of the year. Queen bumble bees, mourning cloak butterflies and blue orchard bees are active in early spring. Monarch butterflies, worker bumble bees and worker honey bees forage from spring into the cooler days of autumn. Gardeners can help pollinators by planting flowers with a sequence of bloom throughout the growing season, from early spring through late fall. Early-blooming trees such as maples, willows and redbuds, and late-season perennials like asters and goldenrod provide important food at especially critical times. Consult oardc.ohio-state.edu/gdd/ for a sequence of native and non-native woody flowering plants for Ohio. Early-blooming maples provide an important pollen and nectar source for bees in early spring. While adult butterflies will drink nectar from many types of flowers, immature caterpillar stages require specific plant species to complete development. Monarch caterpillars require milkweed plants, pearl crescent caterpillars feed on New England asters, and black swallowtail caterpillars feed on plants in the carrot family such as parsley and dill. Include butterfly host plants as well as flowers that provide a nectar source to attract egg-laying adult butterflies. Learn more about specific caterpillar food requirements in the ODNR field guide "Butterflies and Skippers of Ohio" at go.osu.edu/ODNRbutterflies. Flowers planted in and near vegetable gardens and fruit plantings help bring pollinators and other beneficial insects into the garden. Annuals, perennials and herbs provide important food sources for insect pollinators, especially in the heat of summer. Consider planting sunflowers, zinnias, marigolds and cosmos in or near the vegetable garden. Herbs such as lavender, basil, borage, dill, fennel, oregano and catnip will also attract many pollinators. Locally native plants attract native pollinators. Native plants offer nectar, pollen and other nutrients in quantities that native pollinators need. Consider adding more locally native trees, shrubs and herbaceous plants to the garden. Brush piles, dead standing trees and clumping grasses all provide important nesting and overwintering habitat for bees and butterflies. Cavity-nesting bees make their nests in the pith of twigs like elderberry or sumac, or in abandoned beetle burrows in dead trees. Solitary ground-nesting bees usually nest in sandy, well-drained soils on south-facing slopes. Artificial nesting sites can be made or purchased to encourage cavity-nesting bees. These structures require routine maintenance, and even periodic replacement, to prevent the build-up of bee pathogens and parasites. Bumble bees prefer to nest in pre-existing cavities with some form of insulation such as old rodent nests or bird nests, both above and below ground. They will also nest under clumps of grass. Purchased or constructed bumble bee nesting structures are generally considered unsuccessful at attracting bumble bee queens. Bumble bees will frequently nest under clump-forming grasses. Dandelions provide an important source of nectar and pollen for pollinators. A water source in the garden helps thirsty pollinators, especially in the heat of summer. A shallow bowl or birdbath can provide sufficient water. A few sticks placed in the bowl will provide a place for bees and other insects to land and perch, thus preventing insect drowning. Additionally, a muddy puddle may be visited by pollinators like butterflies and mason bees. Limit pesticide use in the garden. Pesticides can have negative effects on bees and other insects, killing them outright or affecting behavior, longevity or susceptibility to disease. Use an integrated pest management approach with multiple strategies to reduce pest damage. Contact your local Ohio State University Extension office for pest management assistance (see extension.osu.edu). 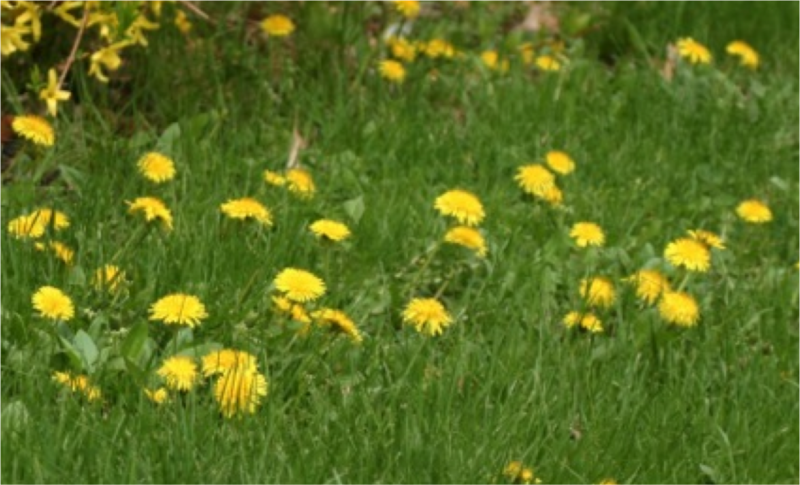 Many plants frequently considered weeds do provide food for pollinators, including dandelions, milkweed, goldenrod and clover. Consider tolerating weeds with benefits to pollinators. On the other hand, many invasive weeds outcompete native plants important to pollinators. Eliminate invasive weeds such as privet, garlic mustard, and buckthorn.